Angiotensin-converting enzyme 2 (ACE2) is a single-pass type I membrane protein belonging to the peptidase M2 family. ACE2 is a carboxypeptidase which converts angiotensin I to angiotensin 1-9, a peptide of unknown function, and angiotensin II to angiotensin 1-7, a vasodilator. ACE2 is also able to hydrolyze apelin-13 and dynorphin-13 with high efficiency. ACE2 may be an important regulator of heart function. In case of human coronaviruses SARS and HCoV-NL63 infections, ACE2 serve as functional receptor for the spike glycoprotein of both coronaviruses. 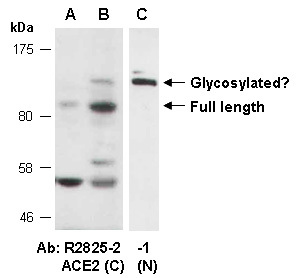 Rabbit polyclonal antibodies were produced by immunizing animals with GST-fusion proteins containing either the N-terminal [ACE2 (N) (R2825-1)] or the C-terminal [ACE2 (C) (R2825-2)] region of human ACE2. Antibodies were purified by affinity purification using immunogen. against 2 distinct regions of human ACE2 at RT for 2 h.